The state-of-the-art retail space enables photography enthusiasts of all levels to discover the entire Leica range, from professionals looking for a point of difference, to those wishing to explore their creativity with the Leica Q, or simply looking for Leica’s fun new instant camera. Avid travellers and escapists visiting the store will also find a century’s worth of expertise in Leica’s extensive sport optics portfolio, including binoculars and rangefinders. Furthermore, the extended retail space provides the opportunity for customers to view Leica’s comprehensive collection of product and brand accessories, making ideal gifts for Christmas. The redesigned layout creates a fully interactive experience for customers, where they can enjoy hands-on demonstrations, discuss photography techniques and meet like-minded Leica photographers. Visitors will continue to find the friendly and experienced Leica Customer Care team at hand to provide technical assistance. An expanded Leica Café will take over the store’s previous location in the New Year, incorporating an intimate photographer’s gallery. It will continue to be a destination for photographers, as well as those simply seeking a great cup of coffee. With major exhibitions to be held at the Leica Studio, combined with the successful Leica Akademie, Leica UK aims to create a unique brand experience and thriving photography hub in the heart of London. 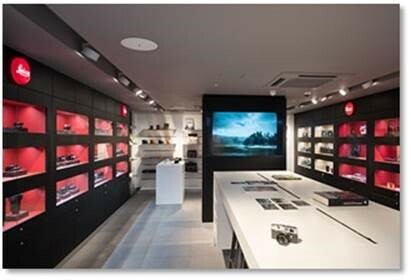 Leica Store Mayfair is located at 27 Bruton Place, London W1J 6NQ. Bruton Place is a discreet location based in the heart of Mayfair between Berkeley Square and Old Bond Street.